جدیری اکبری فام, حسین, شاد منامن, نوید. (1396). مدل‌سازی تغییرات دامنه و فاز امواج تبدیل‌یافته نسبت به دورافت و تغییرات نسبت VP/VS. مجله ژئوفیزیک ایران, 11(4), 67-92. حسین جدیری اکبری فام; نوید شاد منامن. "مدل‌سازی تغییرات دامنه و فاز امواج تبدیل‌یافته نسبت به دورافت و تغییرات نسبت VP/VS". 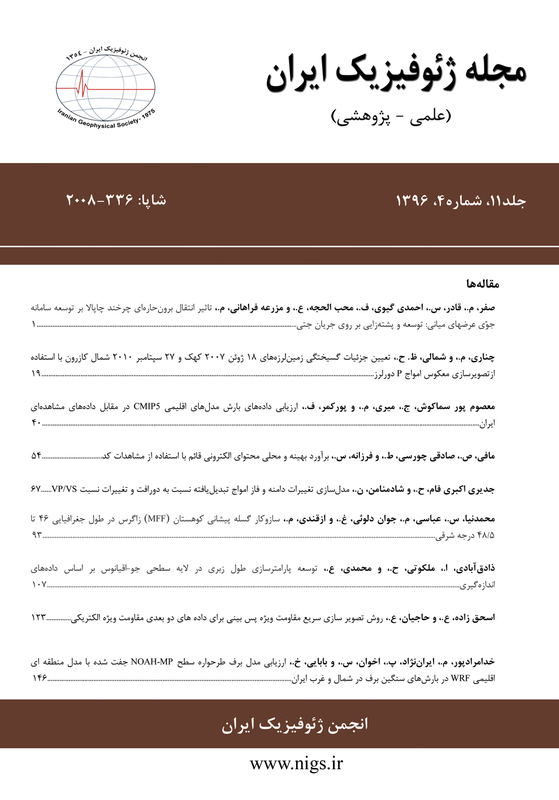 مجله ژئوفیزیک ایران, 11, 4, 1396, 67-92. جدیری اکبری فام, حسین, شاد منامن, نوید. (1396). 'مدل‌سازی تغییرات دامنه و فاز امواج تبدیل‌یافته نسبت به دورافت و تغییرات نسبت VP/VS', مجله ژئوفیزیک ایران, 11(4), pp. 67-92. جدیری اکبری فام, حسین, شاد منامن, نوید. مدل‌سازی تغییرات دامنه و فاز امواج تبدیل‌یافته نسبت به دورافت و تغییرات نسبت VP/VS. مجله ژئوفیزیک ایران, 1396; 11(4): 67-92. اطلاعات امواج برشی در تفسیر لرزه‌ای، نقش ارزشمندی را ایفا می­کنند. به دلیل هزینه بالا و سختی عملیات ثبت داده‌های S-S از طریق برداشت لرزه­ای 9- مؤلفه‌ای (3D-9C)، از اطلاعات امواج برشی نهفته در امواج تبدیل­یافته استفاده شد. در راستای شناسایی هرچه بهتر بازتاب­های ناشی از امواج تبدیل­یافته می‌بایست خصوصیات آنها از لحاظ تغییرات دامنه و تغییرات فاز نسبت به دورافت بررسی شود. در این راستا، با استفاده از روش‌های مدل‌سازی پیشرو و ردیابی پرتو، نحوه انتشار انرژی امواج تبدیل­یافته در محیط‌های همسانگرد و ناهمسانگرد و نیز نسبت­های VP/VS متفاوت در مقاطع لرزه‌ای بررسی شده است. امواج تبدیل­یافته که توسط چشمه قائم و گیرنده­های افقی و یا چشمه افقی و گیرنده­های قائم ثبت ‌شده­اند، پلاریته وارونی در طرفین چشمه خواهند داشت، درحالی‌که پلاریته امواج تبدیل­یافته ثبت شده توسط چشمه و گیرنده­های قائم و یا چشمه و گیرنده­های افقی در طرفین چشمه یکسان خواهد بود. برداشت امواج تبدیلی P-Sv نیازمند زوایای تابش بزرگ‌تر از زاویه بحرانی و بنابراین، نیازمند طول برداشت نسبتاً بزرگ‌تری است، ولی بازتاب دامنه بالای امواج تبدیلی Sv-P قبل از زاویه بحرانی اتفاق می­افتد. با این حال باید توجه داشت، چون در بازتابنده­های افقی زاویه تابش امواج Sv-P با زاویه بازتابش امواج P-Sv برابر است و برعکس، لذا امواج Sv-P و P-Sv در دورافت­های یکسانی ثبت خواهند شد. مدل‌سازی‌های انجام شده نشان می­دهند برای بازتابنده افقی با نسبت سرعت متداول 1.7321، حداکثر تبدیل انرژی از موج P به Sv در حدود زاویه تابش 64 درجه و زاویه بازتابش 31 درجه و حداکثر تبدیل امواج Sv-P در حول زاویه تابش 31 درجه و زاویه بازتابش 64 درجه رخ می­دهد که بسته به عمق بازتابنده متناسب با دورافت­های متوسط تا بزرگ است. از این‌رو، برای ثبت بهتر این امواج می­بایست با توجه به عمق­ سازند مدنظر، از دورافت­های متوسط تا بیشتر استفاده کرد. Shear wave information plays a valuable role in the interpretation of seismic data and reservoir characterization studies. Due to the high cost and technical difficulties in data recording of full elastic seismic data (3D-9C), using converted waves can be helpful to extract valuable S-wave information. Analysis of the amplitude and phase variations of converted waves with offset would be useful in better identification of converted reflections in the seismic sections and uncertainty reduction in the processing and interpretation of these data. In this regard, by using Zoeppritz equations, the energy distribution of different seismic modes (P-P, S-S, P-Sv, and Sv-P) on the interface of the layers with different acoustic impedances at various incidence angles has been studied. Then, by using forward modeling and ray tracing methods, it should be obtained that how converted waves propagate in isotropic and anisotropic media. Besides, the effect of the Vp/Vs variations in the travel time and amplitude of the converted modes are inspected. For data recorded by receivers oriented in the same direction as the seismic source (both vertical or both horizontal), the polarity of converted waves is the same in the positive and negative offsets. However, if the direction of receivers is perpendicular to the seismic source, the converted waves will have opposite polarities on different sides of the source. Moreover, for primary P-Sv reflections, the largest P-to-S conversion occurs beyond the critical angle that is related to large source-receiver offsets. In contrast, S-to-P conversion significantly appears before the critical angle. However, it should be noted that for the same takeoff angle, the Sv-P and P-Sv waves will be recorded in the same offset, because the P-Sv incidence angle equals the Sv-P reflection angle and vice versa. For example, the synthetic models show that in seismic layers with Vp/Vs = and horizontal reflector, maximum P-Sv conversion occurs at an incidence angle of about 64° and reflection angle of about 31°, while maximum Sv-P conversion occurs around 31° angle of incidence and around 64° angle of reflection. This means that from the viewpoint of source-receiver distance, depending on the intended depth, mid and far offsets data are necessary for good recording of the conversion mode reflections. Moreover, according to Snell law and Zoeppritz equations, in the case of converting Sv to P, the transmitting converted P-wave would have a small amplitude. Hence, in Sv-P studies, only the converted waves with purely Sv incoming and purely P reflection are considered. قاسم­العسگری، م.ک.،­، 1383، اصول ژئوفیزیک اکتشافی: روش‌های سنجش و چاه­پیمایی ژئوفیزیکی، آییژ، تهران. نظری، ب.، 1394، اکتشاف هیدروکربن با استفاده از تکنیک AVO در داده­های لرزه­نگاری، محمد طیبی، ستایش، تهران، 34-33 و 36. Aki, K., and Richards, P. G., 1980, Quantitative seismology: Theory and methods. New York, 700. Barkved, O., Bartman, B., Compani, B., Gaiser, J., Van Dok, R., Johns, T., Kristiansen, P., Probert, T., and Thompson, M., 2004, The many facets of multicomponent seismic data: Oilfield Review, published by Schlumberger, 16, 42-56. Bouchaala, F., and C., Guennou, 2014, Analytical and Numerical Study of the Reflection/Transmission Coefficients in Slight Viscoelastic Medium: International Journal of Geosciences, 5(09), 908. De Angelo, M. V., and Hardage, B. A., 2016, Comparing PP, P-SV, and SV-P mode waves in the Midland Basin: West Texas. Interpretation, 4(2), T183-T190. Guy, E. D., 2004, Evaluation of near-surface converted-mode seismic reflection imaging potential: Electronic Journal of Geotechnical Engineering, 9, 1-35. Hardage, B. A., 2012, Extracting SV shear data from P-wave seismic data, Google Patents. Hardage, B. A., 2014, Shear-wave data enhance reservoir characterization: Oil and Gas Journal. 112(7), 65-69. Hardage, B. A., Sava, D., and Wagner, D., 2014, SV-P: An ignored seismic mode that has great value for interpreters: Interpretation, 2(2), SE17-SE27. Hardage, B., and Wagner, D., 2014, 2D Modeling of Direct-S and Direct-P Wave field - Part 3: Reflectivity Modeling Using Real Log Data (USA). Ikelle, L., and Amundsen, L., 2005, Introduction to Petroleum Seismology. Society of Exploration Geophysicists, Tulsa, Oklahoma. Knott, C. G., 1899, III. Reflection and refraction of elastic waves, with seismological applications: The London, Edinburgh, and Dublin Philosophical Magazine and Journal of Science, 48(290), 64-97. Sheriff, R., and Geldart L., 1995, Exploration Seismology: Cambridge University Press. Stewart, R. R., Gaiser, J. E., Brown, R. J., and Lawton, D. C., 2003, Converted-wave seismic exploration: Geophysics, 68(1), 40-57. Tooley, R., Spencer, T., and Sagoci, H., 1965, Reflection and transmission of plane compressional waves: Geophysics, 30(4), 552-570. Yilmaz, Ö., 2001, Seismic data analysis: Processing, inversion, and interpretation of seismic data: Society of Exploration Geophysicists, p. 1813. Zoeppritz, K., 1919, Uber reflexion und durchgang seismischer Wellen durch Unstetigkerlsfläschen: Uber Erdbedbenwellen VII B. Nachrichten der Königlichen Gesellschaft der wissenschaften zu Göttingen: Mathematish-physkalishe Klasse, K1, 57–84 (in German).